"A problem that the majority of my clients report that their dogs are guilty of this but they don't see it as a major issue"
The reason that puppies jump up goes back to their natural behaviour – as the mother approaches, the puppy will jump up as a greeting and request food. The pup is actually not jumping up; rather it is standing on its rear legs and putting the paws on the mother or person. When our little ball of fluff is just that, it is lovely to be greeted in that way – but what happens when our little ball of fluff grows up to weigh 50 kgs? If you think about it, we encourage the behaviour of greeting us by allowing jumping up and then cause total confusion when one day we decide it is not longer acceptable due to having visitors that won’t appreciate the behaviour, are wearing white pants, or a child comes to visit. The easiest way is prevention, which is better than cure. You have a totally blank canvas with a puppy, and it is up to you now as to what you do accept, and what you don’t. Simply don’t allow your puppy to jump, get him into the habit of calling him and then getting him to sit in front of you. This is especially important if your puppy is going to grow to a large size. Even if your pup is not going to be large, it is still a good habit to get into as it stops dogs jumping on us when you have work clothes on or an armful of shopping or if there is a small child or elderly person visiting or staying with us. You would not allow your child to run and jump on a visitor (I hope not anyway! ), then why do we not teach our dogs to approach people politely? Simple, we just haven’t thought of it that way! The exercises below to change the behaviour can be used with puppies for prevention as well. Additionally, request a Sit for anything to pup wants, or does i.e. Sit before being given food, Sit before the ball is thrown, Sit before attention is given, Sit before going out the door - the list is endless. Wrong Attention - Many owners, inadvertently, make the problem worse by shouting or screaming ‘no’ at the pup or dog. 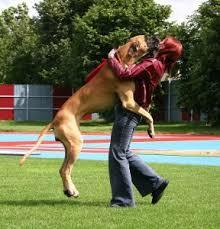 If the owner is a bit volatile they may excite the dog even more resulting in more of the undesired behaviour. Remembering that attention is attention to a dog, whether positive or negative, will give you an idea why this manner of behaving keeps on reinforcing the behaviour in the pup. Being Inconsistent - Another reason that owners can reinforce this behaviour is by being inconsistent. Dogs work harder on a variable reward training system. This is simply because the dog does not know when the reward will be forthcoming so it keeps on trying – a bit like us humans keeping on feeding our money into a one armed bandit! Now if we look at the situation whereby we, as owners are not consistent, and shout sometimes, and accept the behaviour another time, the poor thing is totally confused! Because it has not been taught an alternative behaviour the pup will just keep on trying harder to get the reward of being greeted by the owner by continuing to jump up. We have a bad habit of telling our dogs what we don’t want, but often do not tell them what we do want! It is absolutely impossible to tell a dog to do nothing; we have to show the dog what we do want instead and then reward the dog accordingly for compliance. One of the main reasons that dogs continue to jump up is because one member of the family allows it. With training, you have got to be consistent, no means no, not maybe, or this time its ok. So please do talk to all the members of the family and ensure everybody plays their parts accordingly or else you will end up with a situation whereby the dog does not jump on the owner, but still does it to the other family members and visitors. Jumping up against your back -You may have found in your past dealing with dogs, that one particular dog you have come across will jump up against somebody’s backs instead - a very dangerous behaviour as they can easily send the person flying. This normally happens when people have used one of the old fashioned methods of getting dogs to stop jumping up – they knee them in the chest. Now all that happens is that the dog learns that jumping in the front doesn’t work so starts to jump up behind instead! All jumping up behaviour to be ignored. Each and every time you pay attention you are rewarding the behaviour you dont want. Keep face straight, no talking or interacting, simply twist your body a bit so that dogs paws are removed. No pushing. Using the daily ration of food, call your dog, request a Sit (using both voice and hand signal at the same time) and as the bottom touches the floor, cue is Sit and then offer one piece of kibble. Take a few steps away and repeat. Do this over and over - we are changing the old behaviour into an entirely new one and the dog is being rewarded for same. Do this a lot around doors where dogs normally jump up more, in the garden and all around the home inside and out. In a very short period of time you will have changed the behaviour. If you are at home during the day, then do this throughout the day, feeding a piece of kibble at a time. For dogs that are really food driven and dive into their meals, rather give a small handful of food in the bowl and then use the rest throughout the day. An extra exercise you can bring in which is great fun for the dog as well, is for the family to stand in a circle, or a distance from one another and call the dog back and forth, requesting a sit each and every time. After a few days (and some dogs take longer) when the dog is reliable sitting each and every time, then you will start to fade the reward. request a Sit for anything the dog wants, or does i.e. Sit before being given food, Sit before the ball is thrown, Sit before attention is given, Sit before going out the door - the list is endless. You can keep the motivation going after the behaviour has been successfully changed by taking a few pieces of kibble and at odd times call your dog to you, ask for s a Sit, Praise and treat. When we teach a dog a new behaviour we work with a 100% continuous reinforcement schedule – the dog is rewarded every single time it performs the behaviour. However, the last thing anyone wants is to have a dog that only works for us when we have food available. In order to ensure that the dog does not only work for food, we need to bring in a varied reinforcement schedule as soon as the dog understand the behaviour and is doing it on cue. This is very simple to achieve – instead of asking for one sit, ask for two in a row and then reward. Mix it up all the time, sometimes asking for a sequence of two sits in a row, other times reward every 3rd of 5th sit. Remember that if your dog has just learnt the behaviour don’t be in too much of a hurry and remember to stagger the rewards and work with where the dog is ‘at’. By this I mean that if your dog has only been proficient in the sit exercise for a short period of time, don’t expect it to do 20 sits in a row. Not only will it be bored it will give up – you are asking too much of it too soon. Variable reinforcing tends to make a dog work harder, as it never knows when the reward will be forthcoming. It is important to realize that to some dogs, other types of rewards may be more important than food. A dog that is toy driven can have the ball thrown or tossed for a reward instead of food. Verbal praise may be all some dogs requite or others will prefer a game of tuggies. Don’t forget the dog that is tactile, and a rub from you can be the best thing in its life. You can even bring in a mixture of the examples mentioned above and mix and match them, bearing in mind that it is best to use something that really motivates your dog. Be aware that when you are teaching a new behaviour you go back to 100% continuous reinforcement schedule. What is important however is that a reward on a varied basis is necessary to keep the dog motivated to perform different behaviours – would you work for your boss for no pay, especially on a continued basis? Before bringing visitors into the mix, it is important that the dog is sitting successfully for the family. When you bring in visitors, the exercise below can be done either on or off-lead, but do aim for success. If you have a dog that does tend to get over excited around visitors, then start with the dog on lead to begin with. As this is a new exercise to the dog, we will bring in the food treat after the praise has been given to help the dog to be successful. Once the dog is proficient in the exercise, fading can be started. A way to easily stop this from becoming a habit after you have dealt with stopping the jumping up to family members, is to invite several people over who arrive within about 30 minutes of one another which you have already told to please pay no attention to the dog at all – this is a training exercise. Have the dog on lead when you answer the door with treats in your hand or pocket (or off lead if you think the dog can cope). Holding onto the lead, ask your dog for a sit, praise and reward.Do this several times. During this time your visitor is paying no attention to what is going on and is not talking or interacting with dog. When you feel that your dog is calm, still holding onto the lead, ask the visitor to calmly call your dog, request a Sit, using the hand and verbal cue - the second the bottom hits the floor, quiet praise (we dont want to over excite the dog) and a treat is given. The owner then quietly calls the dog back and the sequence is repeated several times. Visitor then leaves and you repeat with next visitor. ​All it takes as you will seen from above, is repetition and consistency - as Gary Player once said 'the more I practice the luckier I get! A dog smelling bad could be coming from a variety of reasons, not just needing a bath. 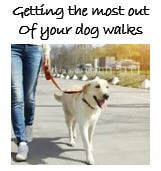 Getting the most out of your dogs walks?